After finding that I could do basic pulse arc welding using the TIG welder, I decided to have a go at a capacitive discharge welder, again primarily for joining stainless steel wire for vacuum tubes. The plan was to use a TIG torch and dump a energy storage capacitor into the gap to give a high-current pulse. To avoid having to touch the TIG electrode to the workpiece to start the arc, I cooked up a high-voltage trigger circuit which provides a ~10kV pulse which breaks down the gap. 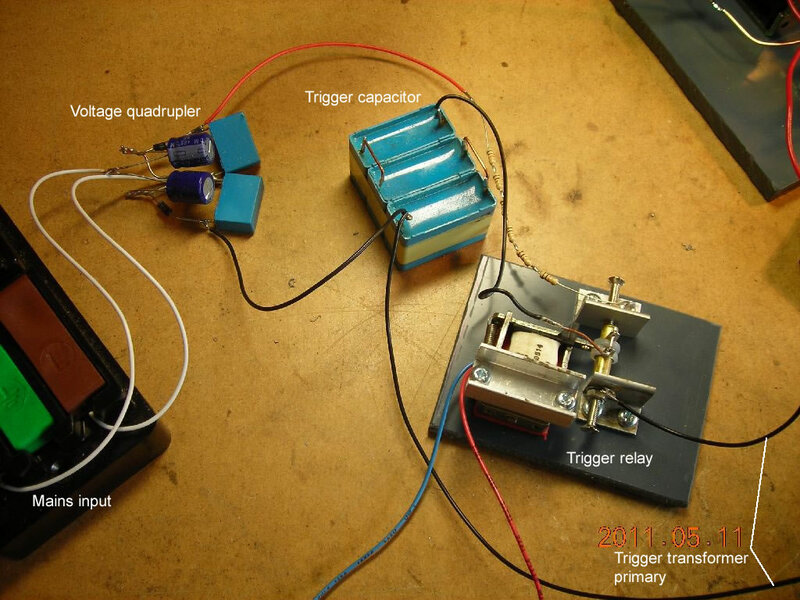 Although the end result is perhaps not too useful as an actual pulse arc welder (the energy is too low, and it would need additional circuitry to provide controlable and repeatable welds), I hope it's of interest from the point of view of the high-voltage trigger circuit. TIG welders use a little circuit to generate a high-frequency, high-voltage pulse to help start the arc. There's a good article on building a TIG welder with HF start here, as a mirror on this site. I had a look at the circuit inside my own TIG welder and it is pretty simple. The photos below show the relevant parts of the welder. Click here for the circuit diagram. 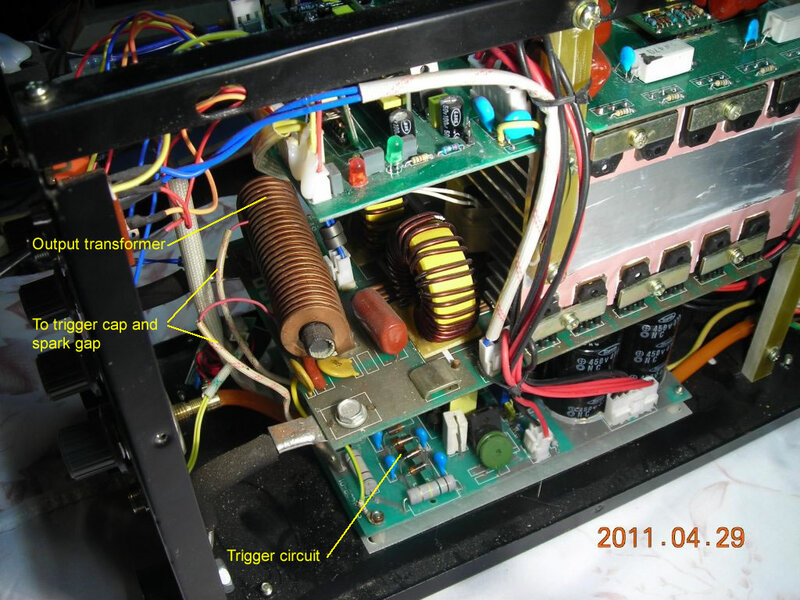 The output from the welding inverter is used to drive a high-voltage transformer. This outputs a few kV, which is then multipled by the Cockroft-Walton stage to give something in the region of 10kV. This charges up the three 1nF caps. When the voltage becomes sufficient, the spark gap breaks down, dumping the stored charge into the primary of the output transformer. The secondary of the output transformer is in series with the welder output, so a HV pulse appears superimposed on top of the welder output. This is sufficient to start the arc. The primary and secondary inductances of the output transformer are 12µH and 24µH, respectively. With a trigger capacitance of 3nF, this results in a frequency of about 800kHz. 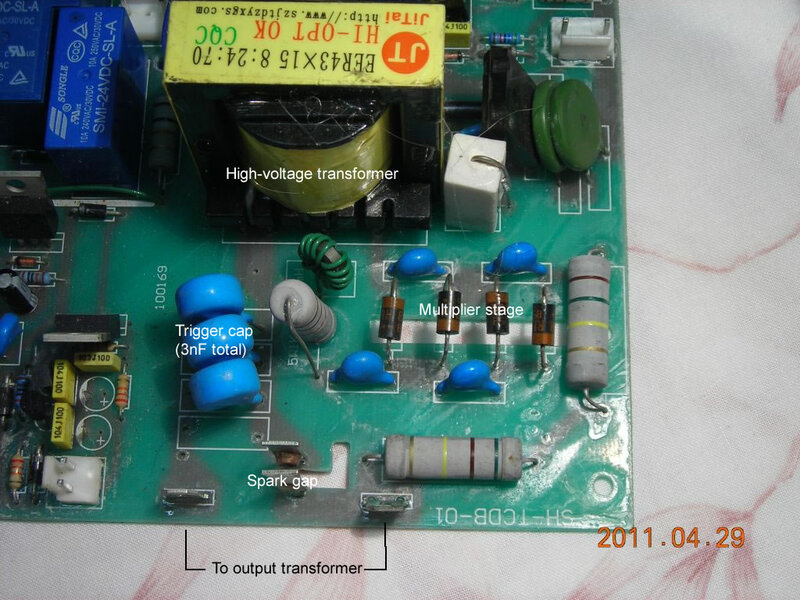 The output transformer is made by http://www.szjtdzyxgs.com (look under arc coil series). 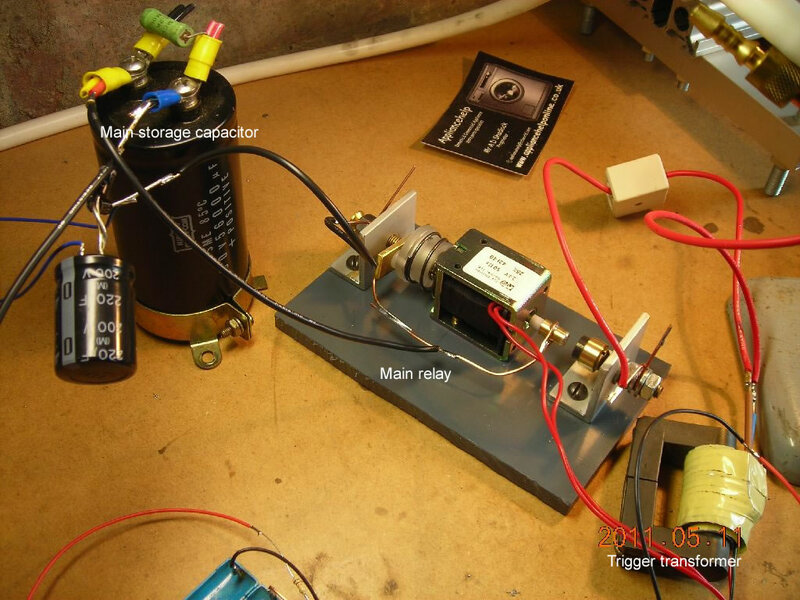 To avoid the need for a high-voltage trigger capacitor, I wanted to see if it would be possible to use a lower-voltage capacitor and an output transformer with a greater turns ratio. In addition, I'm only interested in one-shot triggering, so I wanted to be able to trigger the discharge manually. Have a look at the circuit first. The trigger capacitor I'm using is about 330nF and is composed of C5-C7. It is charged from a voltage quadrupler driven by 240VAC mains to about 1.4kV. 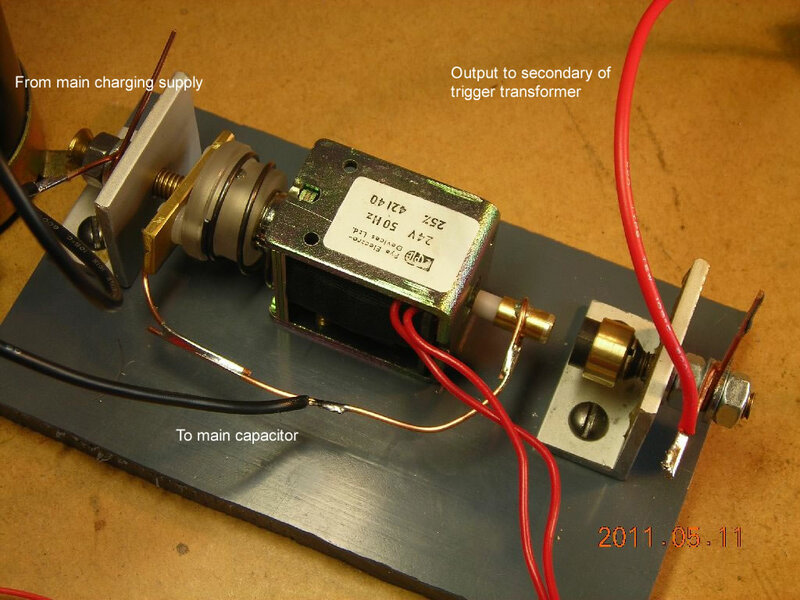 Once charged, it is dumped into the primary of the trigger transformer using a solenoid-driven switch. The trigger transformer has a single-turn copper foil primary and a 10-turn secondary, wound on a TV flyback transformer core. This should give an output pulse of around 14kV. The secondary of the transformer is placed in series with the main storage capacitor (56000µF 50V) and the TIG torch, as shown. Another solenoid-driven switch is used to isolate the main storage capacitor from the TIG torch until ready for discharge. 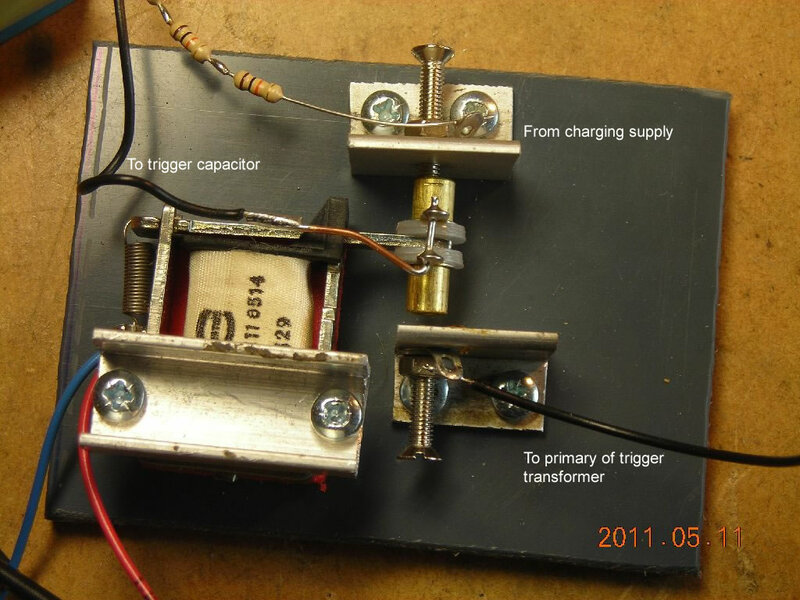 The trigger pulse is very strong and will jump nearly a ¾" gap under argon and has no problem in initiating the discharge of the main capacitor. The main discharge does form little weld pools successfully, but the appearance of the pool depends hugely on the separation of the TIG electrode from the workpiece. Smaller gaps result in smoother welds, but are more difficult to control. Proper pulse arc welders use a solenoid to retract the electrode to a repeatable distance every time, but this is very complicated to implement. As far as joining wires is concerned, I think I'll go back to using the TIG welder with a timed pulse instead. Main relay. The right-hand contact is a silver to grapite contact, to prevent sticking. Lastly, here's a video showing the operation of the various relays and the discharges.